Are you suffering from abnormal yellow lesions on your eyelid? Read on and get to know what is Xanthelasma as also its causes, symptoms, diagnosis and treatment. It is a discomforting skin condition that causes development of unusual yellow papules over the surface of the eyelids. The root of the name of this disease is derived from the Greek word “Xanthos”, meaning “yellow”. This is regarded as the most common type of Xanthoma of the skin. It is mainly seen to affect people who belong to the middle to elderly age group. However, children have also been reported to suffer from these nodules. The condition is found to affect women slightly more than men, with the peak age of incidence between the fourth to fifth decades. As can be guessed, people over 40 years of age are mainly at risk from this condition. However, the disease can affect anyone irrespective of age. As per several medical studies, women are likelier to have this condition than men. Xanthelasma is a subtype of Xanthoma. Xanthoma growths are formed by a deposition of a pale-yellow, cholesterol-rich substance in tendons or other regions of the body. These appear as bumps or sores beneath the skin surface. Xanthelasma growths are larger forms of Xanthoma that look like tumors. These are clearly bordered by yellowish cholesterol deposits under the skin, generally over the eyelids or the region around them. Xanthoma lesions can be found in many areas of the body, such as the hands, elbows, feet and buttocks. Xanthelasma growths are primarily seen in the ocular region. The disorder is primarily characterized by the formation of abnormal bumps under the upper and lower part of the skin surface of the eyelids. These are generally yellow in color and disc-like in shape. The lesions are soft to the touch and have a flat surface with sharp, clear-cut borders. Once the nodules arise, they may either restrict themselves to their usual size or show a gradual growth. These are usually harmless by themselves. However, some affected individuals may complain of irritation. It is a highly common type of Xanthelasma which is found on or around the eyelids. Lesions characteristic of this condition also arise on other regions of the body and should be evaluated from time to time. The occurrence of these lesions, other than changes on the skin surface, may also indicate other health problems. The presence of this disorder is often attributed with an increase in cholesterol levels and other metabolic irregularities. It is supposed to arise primarily due to high amounts of cholesterol, lipids or other fatty substances in the bloodstream. 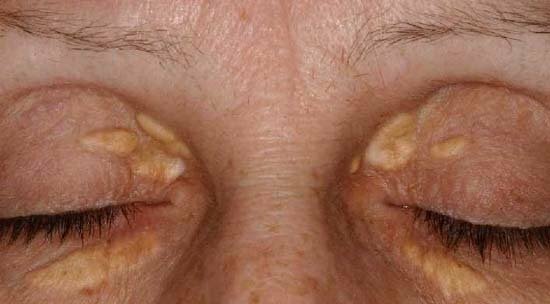 Superficial lesions, characteristic of Xanthelasma, are supposed to occur due to an accumulation of these fatty materials in cells under the skin. LDL is a type of cholesterol that is frequently referred to as “Bad Cholesterol”. A deficiency of this substance in the bloodstream may lead to skin problems. It is an acquired disorder that leads to an elevation of the Triglyceride and Cholesterol levels in the bloodstream of an individual. It is genetically different from the other inherited forms of Hyperlipidemia that are marked by changes in the pattern of Lipoprotein Type II or Type IV. 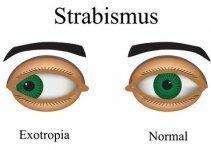 Xanthelasma is also supposed to have a genetic element, which is more common among people of Asian and Mediterranean origin. This disease is supposed to have a genetic association as high blood lipid levels may comprise of a genetic factor. 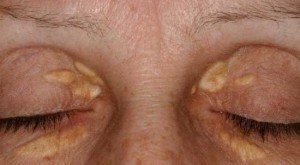 People who are predisposed to increased levels of cholesterol or other lipids in the bloodstream can be more susceptible to Xanthelasma. The condition is best diagnosed by dermatologists or doctors specializing in treatment of skin disorders. Diagnosis initially begins with a physical examination of the skin. Doctors also often carry out blood lipid tests to confirm presence of higher level of lipids in the bloodstream of affected individuals. If an underlying cancerous condition is suspected, a biopsy of the growths can be made. In case of a benign nodule, biopsy will reveal a mere fatty deposition in the region. In some patients, blood tests may be performed to detect changes in lipid levels or unusualities in liver function. Blood examination may also help detect underlying disorders, such as diabetes. 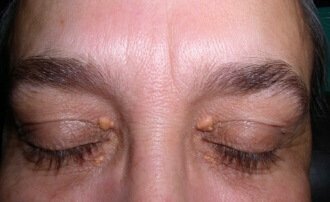 Xanthelasma is often confused with Syringomas and Milia cysts. Syringomas are tiny, skin-colored papules that arise over lower eyelids. Milial cysts are large, spherical in shape and white in color. This condition is usually treated in two ways. Regular exercise – Exercising on a regular basis can help patients shed excess body weight and lower fat content in their body. Regular workouts also help keep triglyceride and cholesterol levels in check. This can automatically put a stop to skin problems arising due to fat deposition. Dietary modification – It involves reducing the consumption of foods high in fats, cholesterol and lipids. Avoiding foods rich in fat, salts and spice can be extremely beneficial in curing the disorder. Consumption of more vegetables and fruits on a daily basis can also help cleanse the system and improve the appearance of skin. Medications – In some cases, patients are also prescribed with medicines that help lower cholesterol levels in the bloodstream. Drugs are usually recommended to be used along with lifestyle-modifying measures to produce best results. If patients have an underlying condition that results in elevated level of lipids in blood, medicines may be used to cure that problem. Curing the causative condition can help lower the number of nodules forming over the skin or even stop their formation. This type of treatment becomes necessary in cases where non-invasive methods fail to bring about any improvement in the skin condition. Removal is generally unnecessary as the nodules themselves do not lead to any discomforting symptoms. However, some patients can find the lesions cosmetically unattractive. In such cases, invasive treatment can be required for lesion removal. Cryotherapy, Chemocautery and surgical excision are the main techniques used for removing these nodules. However, some of these methods may result in scarring or color changes in affected skin regions. In some cases, the growths may even recur after surgical removal. It involves the application of a chemical over the plaque. The effects of the chemical help remove the abnormal growth faster and provide quicker relief. Also known as Cryocautery, this technique involves spraying liquid nitrogen over plaques. Liquid nitrogen freezes the plaques and eventually destroys the fat-filled tissues, thus eliminating the nodules. Surgical excision involves shaving off the lesions entirely with the aid of a sharp instrument. The process helps remove the underlying tissue, thereby obliterating all superficial growths. Bumps arising over the eyelid can be easily removed with a simple surgery. However, patients should be aware that recurrence is common, especially if the underlying high lipid level which causes the xanthelasma is not addressed. They can recur after any of these interventions. However, surgery is not enough to ensure permanent removal of these papules. No specific home remedies are yet known for this disease. In many cases, the condition has been found to resolve with proper dietary and lifestyle changes. Some people who are genetically predisposed to this disease may also consider medications. Here are some methods that can help you cure or avoid this condition without medical treatment. In some regions, garlic therapy is quite popular for removal of these lesions. The process involves cutting mid-sized garlic cloves into half and pressing a halved section onto the affected area. This allows garlic juice to settle over the nodules . Individuals using this technique generally do not experience any other difficulties other than a slight burning sensation. The process must be repeated over three to four days to yield effective results. The technique helps shrink the nodules fast and even relieve any discomforting symptoms, such as redness and inflammation, which are rarely experienced. Fresh, oily garlic works best for this purpose. If your work requires you to sit before your computer for a long time, try to take frequent breaks and stretch yourself. This will give you some much needed exercise and help you shed some calories. People affected with this condition may also try scrubbing their face regularly. You may use a deep cleanser to clean you facial skin and gently scour it with an exfoliating scrub. This will help remove oil and dirt off your skin and provide it with an unblemished appearance. The condition is harmless in itself. Once the plaque materializes, it tends to stay the same in size or grow gradually. The nodules do not shrink in size. Usually, it does not impair eyelid function in any way. Ptosis is rare. These are painless and non-cancerous growths. However, they can be a symptom of some other underlying medical condition that requires treatment. Up to 40% of lesions show recurrence following treatment. Any related morbidity can naturally affect prognosis. Generally, this is not a problem as the color and location of the nodules are characteristic. There is no definite way to control this condition. However, following good skin hygiene may help you avert this disorder. Regular exercise and proper dietary habits may help you control levels of lipids, triglycerides and cholesterol in bloodstream. This can help avoid an occurrence of this disease. If left untreated, the nodules usually do not give rise to any complications. Problems may arise if conditions, such as high blood cholesterol, are not addressed. Acute health conditions, such as high blood pressure, may arise as a result. Deposition of cholesterol may lead to contracting and hardening of the arteries, a condition that is better known as Atherosclerosis. Association with Atherosclerosis may lead to other serious problems, such as Myocardial infarction, Ischemic stroke and even death. Generally, most Xanthelasma lesions arising around the ocular (eye) region do not impair functions of the eye or eyelid. There is, however, a very slight possibility that this disease may cause Ptosis. 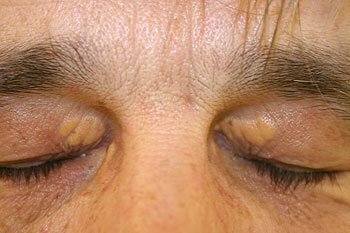 Ptosis is a condition characterized by the sagging or unnatural lowering of the eyelid. Presence of these nodules may also suggest increased lipid levels in the bloodstream. This can indicate that the patient is at risk of heart ailments and other disorders that are associated to high blood lipid levels. The nodules may also change the physical appearance of patients. This is known as cosmetic disfiguring. Here are some Xanthelasma photos that will help you get an idea about the physical appearance of this disease. Check out these Xanthelasma images to know how nodules arising due to the condition look like. If you observe a Xanthelasma nodule on your body, get in touch with a dermatologist or a heath care provider who specializes in skin problems. If you suspect yourself to be having elevated blood lipids, you may also consider visiting a general practitioner to discuss possible causes and undergo diagnostic tests. It is better to seek early treatment as the growths may be suggestive of an underlying disease that requires immediate treatment. High Fructose Corn Syrup causes the liver to produce cholesterol. I have cut out all high fructose corn syrup from my diet and added whole grains and leafy greens. I have lost 50 lbs. I have large xanthoma lesions under both eyes and above the eyes. One woman I met coming out of a 7-eleven stopped and told me that she had had them under her eyes too. Her doctor took a very very tiny needle such as they use in Liposuction to get rid of fat in the hips and thighs and sucked the deposits out. I’m going to give the garlic a try.